The Theatre Royal Hanley Tour of The Rocky Horror Show was many people's first introduciton to the wonderful world of Rocky. The tour ran during the late eighties and was the first major tour that the audience really got into the participation side of things. 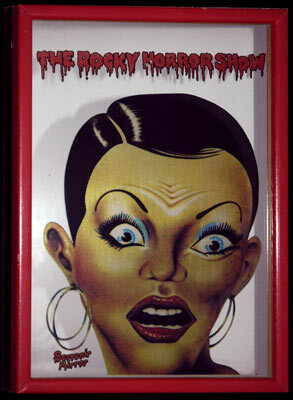 Hanley also produced some great merchandise, along with the usual t-shirts, brochures and mugs they produced other licenced items such as these Rocky Horror Souvenir Mirrors. 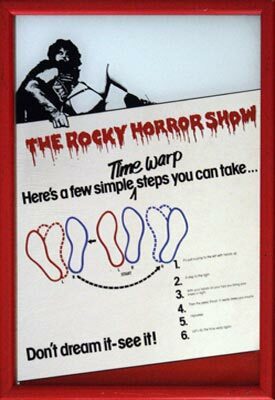 Each measuring 30cm x 20cm (32cm x 22cm including the frame) the Mirrors featured the Columbia image as used for the Roxy shows or the TimeWarp instructions. The Mirrors have a silvered surface, my photographs are reflecting a white wall, hence the colour and shadows seen here. No longer produced of course, there are a few examples out there for the collectors amongst you to search out. Expect to pay around twenty to thirty pounds for a mint copy, ten to twenty for one with small amounts of damage. One of the nicest items of merchandise produced as they were rather unique, many shows made t-shirts, etc. but these mirrors are just that little bit unusual to be of real merit to a collection. Not the most practical items for checking your make-up though as a lot of the reflective surface is covered in text and image.